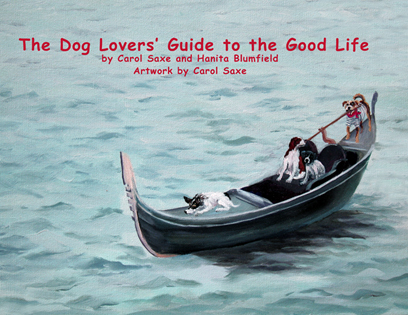 Carol Saxe is proud to announce the release of The Dog Lovers' Guide to the Good Life, illustrated by Carol and co written with Hanita Blumfield. The book, priced at $29.99 is a 76 page, hard cover, full color, 8.5 x 11" edition with 33 illustrations and sensitive, moving introductions by both authors. 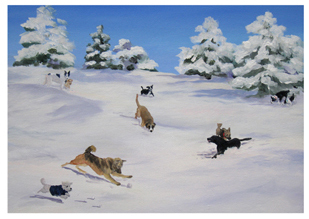 The Dog Lovers' Guide is a wonderful gift, conversation piece or coffee table book. 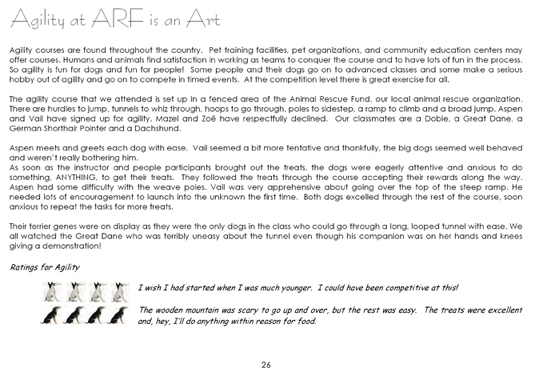 The Dog Lovers' Guide to the Good Life is a hybrid, part art book and part guide book. The text is supported by unique artwork which has been featured in magazines and posters. 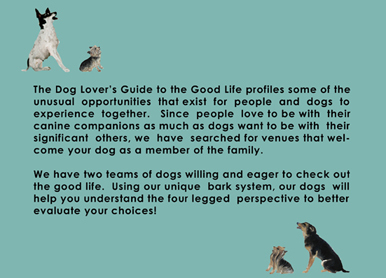 The Dog Lovers' Guide to the Good Life profiles some of the unusual opportunities that exist for people and dogs to experience together. Since people love their to be with their dogs as much as dogs want to be with their significant others, we have searched for venues that welcome your dog as a member of the family. 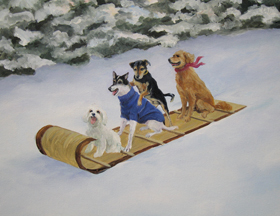 We have two teams of dogs willing and eager to check out the good life. Using our unique bark system, our dogs will help you understand the four legged perspective to better evaluate your choices. The book ends with a chapter encouraging rescue and adoption. The dog Lovers' Guide is not only unique, attractive and informative, but also promotes a healthy understanding of our dogs' needs. Original paintings and limited edition prints from the book illustrations will be available for sale.